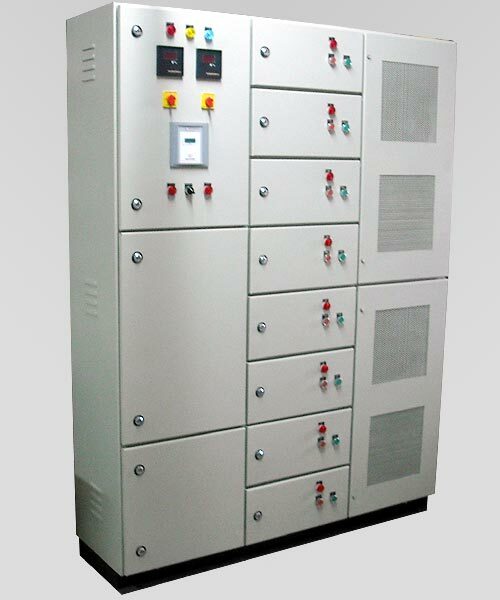 Precise India Is Conspicuous APFC Panel Refer As Automatic Power Factor Control Panel Manufacturer, Supplier Based In Ahmedabad, Gujarat, India. APFC Panel Is Essentially Used To Improve Power Factor Which Is A Measure Of Electrical Systems Efficiency. The Ratio Of Productive Power (kW) To Total Power (kVA) Is Called The Power Factor (PF = KW / KVA). It Is A Measure Of The Systems Electrical Efficiency In An Alternating Current Circuit And Is Represented As A % Or A Decimal. APFC Panels Can Meritoriously & More Prominently Automatically Undertake The Quickly Changing & Scattered Loads Along With Retention Of High Power Factory. Precise India Manufacture The Customized APFC Panel Which Are Available In Different Current Ratings To Accommodate To Various Diverse Applications. Manufactured Using High Grade Stainless Steel Material. Equipped With Capacitors With Series Reactors For Minimizing Harmonic Current Which May Alter System Voltage & Current. Cost-effective With Quicker Remuneration Periods. Capability To Sustain A Constant High Power Factor. Eradicates Low Power Factor Consequences Levied By Earth Bus. Mends The Efficiency Of System By Reducing Losses. Resin Filled / Gas Filled / APP.